1 Heat the oven to 180C, Gas 4. 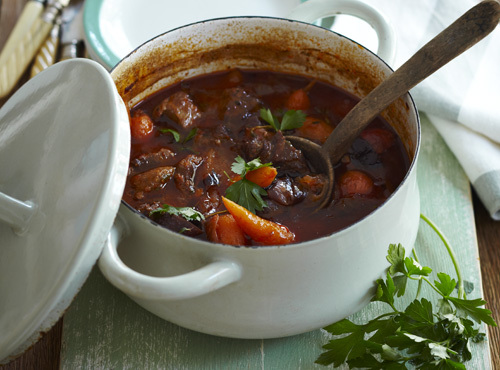 Take a casserole and add all the ingredients; the beef, onion, garlic, a couple of sprigs of parsley or thyme, carrots, beef stock, sun-dried tomato paste, vinegar and gravy granules. Stir to combine. 2 Cook for 11/2 hours until the meat and vegetables are tender. 3 Serve sprinkled with the rest of the parsley or thyme. Great with garlic bread.